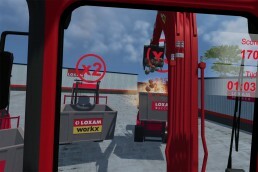 Loxam is a rental company for building materials and equipment that has multiple establishments in Europe. For the yearly “Bouwbeurs”, a construction fair in the Netherlands, Loxam was looking for a way to attract a crowd to their stand. They wished to create a VR simulation to let visitors experience what it is like to use an excavator. An experience was created that combined a simulation with a challenging game. 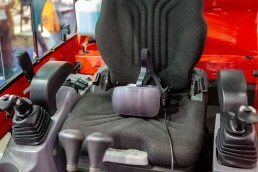 Visitors could take place in a physical excavator, put on a Oculus Rift and interact with two joysticks in the virtual game. The goal of the game was to move as many stones from one container to another in the least amount of time. At the start of of the experience players would fill in their name, company and email address. Then a tutorial followed that explained the game and its goal. After the tutorial, the game started and the player had two minutes to play the game and get the highest score possible. Frank, an employee of Loxam, was so enthusiastic that after many tries he had the high score of the day. On two external screens visitors could see how the player performed with the game and see his score. This created a positive tension amongst the visitors: will the player reach the high score and beat our company? The construction fair was a great success for Loxam. Hundreds of people played the game during the three-day event. Groups of people were waiting in line to try the game and reach a high score. The game became the conversation of the event. After the event all players were contacted with a personal email that contained their highest score.